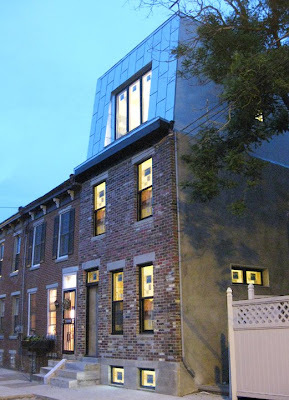 Bench Dog Design is a custom furniture design + fabrication shop located in the Fishtown neighborhood of Philly. 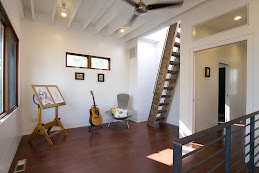 The mission of our shop, stated above with logo, continues the legacy of quality design and sustainable practices set forth in the Montrose project but at the smaller scale of uniquely crafted works of art. Bench Dog is a partnership between the members of Southern Liberties, LLC (Christopher + Emily Stromberg) and our good friends and longtime collaborators David Quadrini and Jenny Yip. We have opened up a full-scale wood shop (actually located within a large metal shop) and will be building prototypes as well as commissioned pieces including dining room tables, coffee tables, shelving units, benches, built-ins, etc. We are also planning a line modern, efficient, multi-functional children's furniture this fall. And we have good news... We recently completed our first commission: a dining/conference room table for the 100K House, located just around the corner from our shop. The good folks at Post Green offered us the opportunity to design and build a table for them using recycled steel and reclaimed timbers (a couple of which were actually from the Montrose house), and we jumped at the chance. With such similar philosophies of sustainable design, the collaboration made perfect sense. Check out the great blog post they did about the table. We were able to finish it by their ribbon cutting ceremony on 03/31 and it appeared to be a big hit. Please check our website...and make sure you go to the Flickr site to see all the photos. We recently had a good friend take some professional photos of the table which will soon be up on our website. If you or anyone you know is interested in a custom-designed piece of furniture made from local reclaimed timbers...give us a call! We recently generated several 3D renderings of Montrose Green in order to help better illustrate how the house is put together and generally how it works. We are pretty excited about how they're coming along. We still need to add some notes to the drawings to help explain them, but we figured we would go ahead and post the progress images. 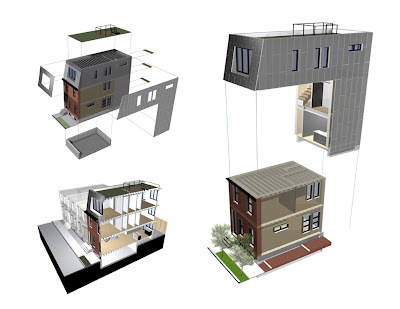 The rendering on the right shows the extent of the original rowhome (below) and how it relates to the new addition (floating above). You can see that we have added a significant amount of square footage to the house...we basically doubled its size. This rendering also shows the 4' wide alley, or easement, next to the house that we paved with reclaimed brick from the old facade as well as the extent of the stormwater planter out front (in green). The rendering on the top left indicates the new elements that make up the building skin (i.e. the green roof, the third floor metal mansard roof, the fiber-cement panels at the third floor and rear addition, and the sun shades at the south facade.) In the rendering, these elements are pulled away from the house in order to show their location relative to the overall design. The rendering at the bottom left is a building section cut through the center of the house. The ultimate intention for this drawing is to show how all the 'systems' in the house work (i.e. passive and active ventilation, daylighting, HVAC, water management, etc. Many thanks to our friend and coworker, Justin, for taking the time to create these images. A quick post to show everyone the latest shot of the front facade with the new (old) Bluestone steps and sidewalk. This was taken around twilight on one of the beautiful Philly spring evenings that we're enjoying these days. We're almost finished installing the floors (it's taking forever!) and have a team of carpenters coming next week to help us knock out the rest of the trim. Almost all of the tile is done. Many thanks to Merlin (our GC) for jumping in and helping us out with the tile installation. The appliances arrive on Friday so the kitchen needs to be set (most of it is assembled) so the fixtures can go in their respective places - one reason we MUST have the floors done asap. We ended up going with the Cafe line from GE for the kitchen appliances. We liked the simple, modern and professional feel of the appliances as well as all the great write-ups. Moderately priced too. We went with Whirlpool Duet Sport (stackable) for the Washer/Dryer. We had our sights set on the LG Tromm until we saw this frightening news piece. Sometimes procrastination pays off. It's beginning to feel that the end is surely near. Famous last words, huh. The Spring season has brought us many welcomed changes: sunshine, warm breezes, and much needed rain. Along with these has come the amazing revival of our green roof. After long months of hibernation, the sedums are rapidly filling in. I have to admit, I was somewhat skeptical all winter as to whether the tiny plants would survive the harsh season. Well, as you can see in the side-by-side images below, the tiny plants aren't so tiny anymore. The images (above left) show the plugs just after installation- each was about 1-3" tall. They grew a bit in the fall, but the bulk of the growth has happened in the last couple of months. While each plug has grown in height, they have also grown tremendously in width, shooting off multiple stems from each plant (above right). With the spring showers, there has really been no need for watering. 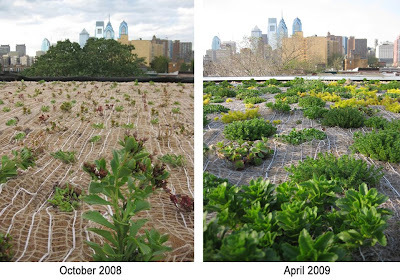 Depending on how dry our Philly summer is this year, we may need to supplement with additional water to ensure that the plants are fully established. Since this will be their first summer, we want to make sure they're strong enough to survive the heat. After the plants are fully established, no additional watering will be necessary. 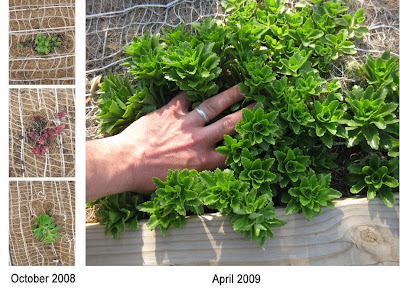 Sedum plants are classified as "succulents" because they hold water in their leaves and are drought-tolerant. JIG (our green roof installers) had initially estimated that it would take roughly two growing seasons to fill in and create a continuous "carpet" of plants and it seems we are well on our way to accomplishing that. 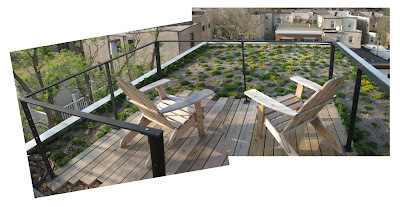 The type of green roof we installed is a Type II: Aromatic Garden by Roofscapes, Inc (the Philadelphia-based green roof engineering firm founded by Charlie Miller). JIG is the certified local installer of Roofscapes green roof systems. You can read more about our green roof installation in our previous post from last September. Needless to say, as we rapidly approach the completion of work on the home's interior, we are thoroughly enjoying our lunch break spot up on the deck. Below you can see the recently installed steel support posts and railing (courtesy of our trusty steel fabricator, Bill Curran) that surround the roof deck. The final step will be to install the galvanized aircraft cable that spans in between the posts.